Welcome to Vienna Westend City Hostel in the city center of Vienna! 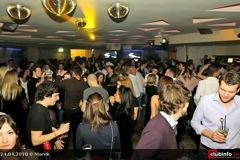 Our WESTEND CITY HOSTEL is the most centrally located international youth hostel right in the center of Vienna. Our prime location in the old town of Vienna, close to the Westbahnhof (western railway station, with the new shopping mall “Bahnhof City Wien West”) and Innere Mariahilfer Straße enables you to get to most sights, restaurants, cinemas and clubs quickly. The Mariahilferstreet ist the most famous shopping street with a car-free-Zone and a bikeway in Austria. Westend City Hostel is located directly on the famous shopping street. Start your shopping experience from Westend City Hostel. We offer discounted car tickets for he APCOA parking garage. On the entire Mariahilferstreet there is free WLAN available. Raimundtheater (for musicals), Stadthalle Vienna (pop concerts) and museums are within walking distance. 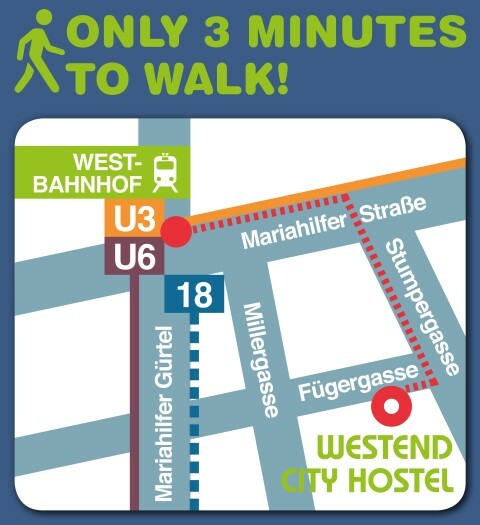 Since we are that close to Westbahnhof (trainstation, Metro U6/ U3, tram Nr. 18, Airportlines Busstation) it is very easy for you to get here. To Stephansplatz in 5 minutes with the Metro U3 or 30 minutes walking distance through a nice shopping boulevard; to the Schoenbrunn castle (Zoo) 10 minutes by tram Nr. 60; to Praterstern 15 minutes with Metro U3 and U1; to Vienna Central train station (Belvedere castle) 13 minutes by tram Nr. 18. In about 15 minutes walk through the Mariahilferstraße you reach the popular Viennese Ringstrasse (Wiener Ringstrasse) with many historical buildings (Rathaus, Parlament, Heldenplatz, University of Vienna (Uni Wien) and the museums at Maria Theresienplatz). Trendy shops – hip clubs – museums – theatres and operas – modern architecture and classicism: in Vienna this is no contradiction at all. Take your time to explore Vienna – the city of contrast! Our youth hostel is open twenty-four hours a day. We offer spacious rooms at reasonable prices for families, groups and backpackers. 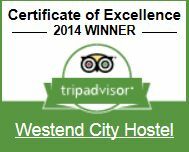 We look forward to welcoming you soon at Westend City Hostel! Come to Austria and visit the homeland of the Trapp family „The sound of Music“, Arnold Schawarzenegger and Mozart. We warmly welcome you with an international team from Austria, Scotland, Romania, Turkey, Armenia, Bulgaria. We love the world. We love you! Discover the most beautiful Easter markets in Vienna. The Easter markets in Vienna offer artfully decorated eggs, Easter decorations, music program and entertainment for young and old in the weeks leading up to Easter. Also culinary and drinks are offered in the markets.